The first Ghanaian Chief Executive Officer of the global telecommunications giant, MTN, Ebenezer Twum Asante, has promised to make a strong case for the Ghanaian as having the wherewithal to manage multinational companies, if given the opportunity. He has also pledged his determination not just to maintain the lead of MTN in the local telecommunications industry, but also strive very hard to expand the frontiers of the company during his tenure. 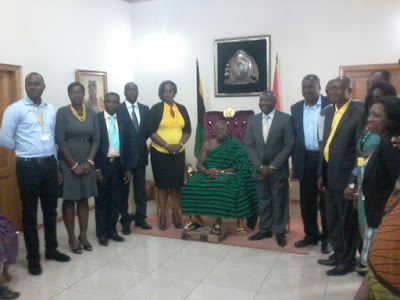 His assurance is in an apparent acceptance of a challenge thrown to him by the Asantehene, Otumfuo Osei Tutu when he led a delegation of the company to pay a courtesy call on Otumfuo Osei Tutu at the Manhyia Palace in Kumasi. It was to show appreciation to the Asantehene for being one of the highly ranked Ghanaians to advocate the appointment of a Ghanaian to head the multinational telecommunication company. He was accompanied by some top management members of the company. The CEO thanked the Asantehene for being the first to make a case for the ability of Ghanaians to head the company, an advocacy that has now resulted in his appointment. He promised not to let Otumfuo Osei Tutu in particular, and Ghana in general down in his new portfolio. Mr. Asante hinted of his strategies to further grow MTN in Ghana. One of such strategies, he said, is to introduce new innovative products in the areas of digital and internet services in the financial market. The Asantehene recommended that he leads the MTN to take up new challenges in information communication technology. One such unexplored areas, Otumfuo Osei Tutu noted, is the setting up of a technical institution to offer pure ICT skills and knowledge to senior high school graduates who could not meet the admission criteria of the country’s tertiary educational institutions. Such people, the King noted, have become despondent and frustrated in the educational system. Another area worthy of exploration by MTN, he noted is distance education and telemedicine. The Asantehene commended highly, MTN MTN for its commitment to corporate social responsibilities, good rapport with statutory institutions with over sight responsibility of the telecom industry as well as job creation for Ghanaians. He appealed for the support of all Ghanaians for the new and first Ghanaian Chief Executive of the company to enable him and his team to succeed. ‘His success is or failure affects all Ghanaians”, the Asantehene stressed. The delegation used the opportunity to present a cheque for GHC 15, 000 towards the Otumfuo Charity Foundation and GHC 5,000 towards the printing of literature about the Manhyia Palace and related matters. Prior to his joining MTN Ghana in 2008, Mr. Ebenezer Twum Asante had worked with Unilever Ghana for about 13 years. Upon joining the MTN telecommunication, Mr. Asante contributed to the growth of the company in diverse ways including his membership of the Global Advancement Programme in 2010. Until his latest appointment as the Chief Executive Officer of MTN Ghana, Mr. Ebenezer Twum Asante was heading the company in Rwanda. He succeeds Serame Tankobong who recently resigned as the CEO of MTN Ghana. The New CEO holds a Post Graduate Diploma in Management from the Henley Management College as well as a Bachelor of Arts in Economics and Statistics from the University of Ghana. He assumes duty at a time when the company holds about 51 percent of the local market share of the telecommunication industry and seeking to maintain its lead and break new grounds. MTN has already captured about 51 percent of the Ghanaian telecommunication market. It has also invested about GHC 2.6 Bn in the Ghanaian economy since its entry on the local scene in 2008 after taking over from Areeba. The company spends about GHC 19.5 million on its corporate social responsibility with a focus on formal education, health and information communication technology. The Ashanti region remains a major market for the company and currently employs about 30 thousand people who trade in various aspects of the company including scratch cards vending and mobile money.